For each flow, Lifecycle Optimizer tracks and displays the number of times users have entered the flow, reached each step, and entered each branch after a check. Lifecycle Optimizer also displays email performance metrics for each “Send Email” action in the flow. All data on the flow list is presented in realtime at page-load time. When viewing an active flow, all data updates in realtime. On the List Page (which displays Entries only) and by clicking the Metrics link to jump to the builder’s Metrics view. An entry represents any start of a flow by a user. Entry counts can include multiple entires by the same user if re-entry for a given flow is permitted by your flow settings. In the Builder, using the Metrics button to enable the Metrics view. These stats are specific to the step. If you use the same template twice, each use of the template will display unique stats. Changing a step’s template in an active flow will not reset the step’s metrics. Flows created on or before October 24, 2017 will continue to display Sent Counts for the “Send Email” action. 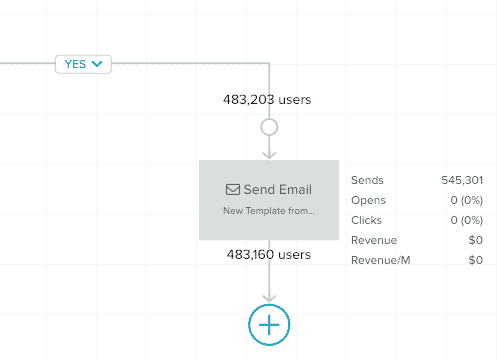 For any such flows, you can “Save As” to reset metrics and begin collecting and displaying full email metrics. If you deactivate a flow, its metrics will remain viewable. If you reactivate an inactive flow that previously ran and had users, the metrics will aggregate.